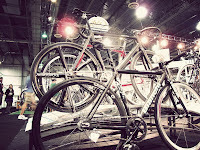 stickboybike: 2010 Interbike goes down in the books. 2010 Interbike goes down in the books. It was no secret that 2009 was a season that had retailers biting their nails. 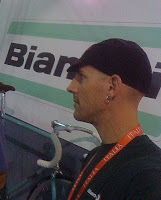 With that dark cloud leading up to Interbike, it was going to be anybodies guess as to how busy the booth would be. Keeping the stress levels low this trip, I flew out of HIA. 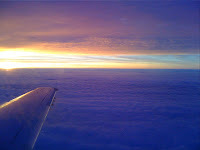 Traveling at the crack of dawn has it advantages; obviously an early arrival for those inclined to help set up the booth and second, a magnificent view above the clouds. Sun up courtesy of United Airlines. I can see from where the color of our bikes has originated. If you separate the tangerine and yellow and you can detect a hue of celeste'. Most of the booth construction was done prior to my arrival, so I lent my cleaning skills to wiping the bikes and primping here and there. The bike in the back ground is a show concept bike-- Pista Classica. Bianchi fans alike were freaking out over this bike. The final booth, stocked and ready to roll. 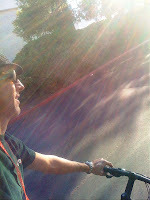 For the second year in a row I was surrounded by the finest mountain bikes which are made in the USA- IBIS and Intense. Looks like it'll be a good week. The crowds rolled in and overall Wednesday and Thursday were really strong days for showing the line. 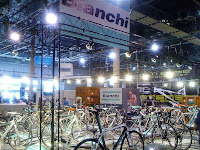 It seems the LBS are looking for retail solace with a brand like Bianchi. Tim and Ace from TRAFIK stopped by the booth. Ace had his micro 2004 Pista Concept. I love how the photo above came out. The 2010 Super Pista frameset and the 2004 PC. Thanks for the props guys! Be sure to check out 'To Live & Ride in LA'. It's should drop sometime next month. The general opinion of the 2010 bikes is, Wow! New models like the 928 SL IASM, Infinito Ultegra, Super Pista, Vigorelli, Dolomiti Athena, Via Brera/Condotti all took top mentions. In fact, at the beginning of the show I joked about our Gran Fondo and Urban categories as they flanked the same isle. My thoughts were, daily, the carpet would be worn out more than any other row. Sure enough; the end of Wednesday and Thursday the carpeting was pill'd up way more than the other rows. Besides our steel road bikes being the benchmark of the industry, we've made changes to the Via Nirone bicycles by upgrading their cranks to Shimano from FSA and Prowheel (excluding the VN Tiagra). Who wouldn't want better shifting, especially on the front. I'll do some individual reports on key bikes and outstanding comparisons as the winter approaches.